This page is packed full of strategies for making friends, strangers, and ultimately the whole world lose The Game. Please read on and contact us with any more ideas. If you can make thousands of people lose The Game you could win a legendary Game Award! Triggering mass loss on a global scale. On the 12th December 2012, everyone will do everything they can to make everyone else lose The Game. There will be mind-blowingly insane stunts, crazy parties and all sorts of other awesome events. The Lose The Game Legends (see below) are the hive mind behind the operation, and we have region-specific cells planning chaos across the globe. Use the strategies listed on this page to help us in our mission to make the world lose. You can start to spread the word with our epic LTG Day 2012 trailer. 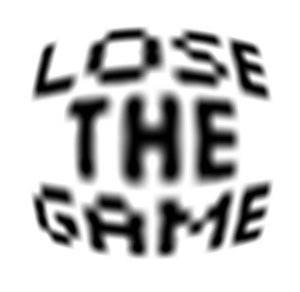 The Lose The Game Legends are an elite, international taskforce of experienced losers dedicated to making the whole world lose The Game. If you think you're up to the task, join the Facebook group here! Below are our region-specific Facebook groups dedicated to causing global loss. If your city/region isn't there, lead the way by creating a Facebook group/page and send us the link. Insane stunts that will make the world lose! Crazy stunts get people's attention, and attention is what we need to make everyone lose The Game. 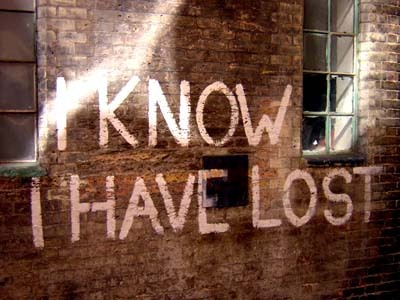 Guy Hurst covered every wall and piece of furniture of his friend's flat with 'The Game', Kaytee Cahill wore a Lose The Game t-shirt every day for one year, and Graham Campbell and James Cook made a truly epic 10,000 mile journey from London to Mongolia in a car painted with 'LoseTheGame.com'. Check out the details of these amazing feats on our Awards Page. If you think you can do something crazy in the name of The Game, let us know and we'll help any way we can! We are raising funds to pay a sky-writing company to write 'LOSE THE GAME' in half-mile tall letters over the city of New York. Millions would lose and history would be made. Head over to our donations page to be a part of this epic event. 你正在玩游戏。 That's 'You are playing The Game' in Chinese, which means that over a billion new minds can be infected with The Game. 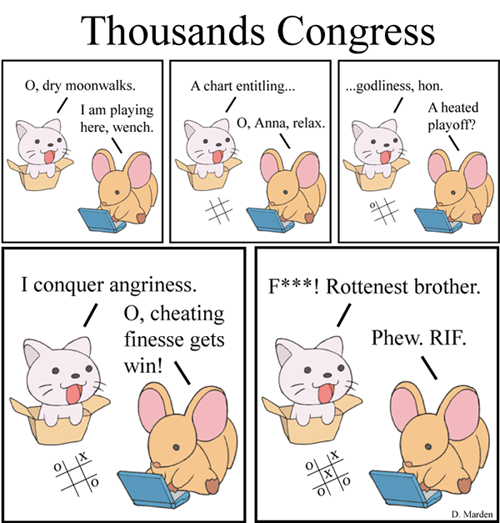 With the help of dedicated losers from across the world, we've translated the rules of The Game into over 50 different languages. Please check the drop-down menu below. 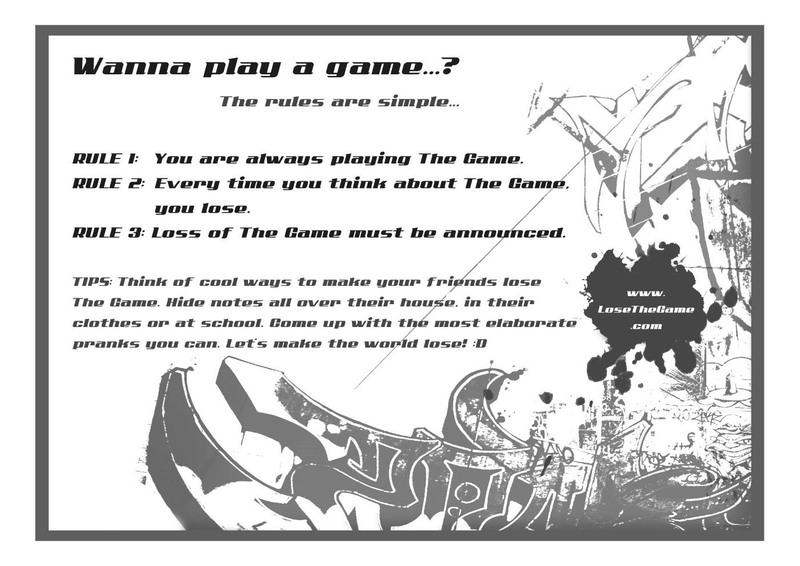 If you can speak a language fluently that we don't already have, please send us a translation of the rules of The Game. If you know any of our current languages, please check it and let us know if anything is incorrect. If you're really dedicated and want to help translate the whole website, please let us know and you can be featured on our credits page! Check out our online shop for loss-inducing merhcandise!  Created in 2006, the I Just Lost "The Game" Facebook group reached over 200,000 members actively losing The Game. 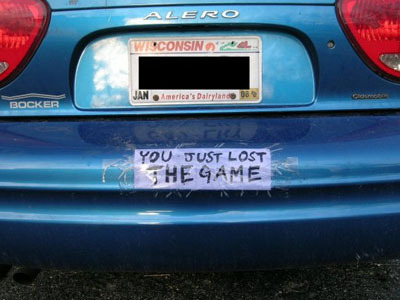 In 2011, Facebook deleted groups over 5,000 members so we're encouraging the losers of the world to use our 'I just lost The Game' Facebook page to make all their friends lose. Facebook Offensive - Make all your friends lose! Change your middle name to The-Game, or The'Game, or whatever else will make everyone lose. A number of popular YouTube celebrities have already been infected with The Game and have won legendary Game Awards for their efforts to spread the infection further. The Vlogg Brothers, Meekakitty and JenxTheJinx have all lost The Game in videos viewed by hundreds of thousands of people. If you know any popular YouTubers, contact them and convince them of the awesomeness of The Game. Here's a list of the most popular YouTube channels. What do Robin Williams, Sylverster Stallone and Team America all have in common? Watch the official LTG Day trailer and find out! Feel free to download it (100MB) and upload it all over the net. Lose The Game as loudly and creatively as you can, in the busiest place you can, and upload a it to YouTube. The highest rated video will win an LTG t-shirt and a legendary Game Award! Try to get your friends involved and do something totally crazy to get people's attention! 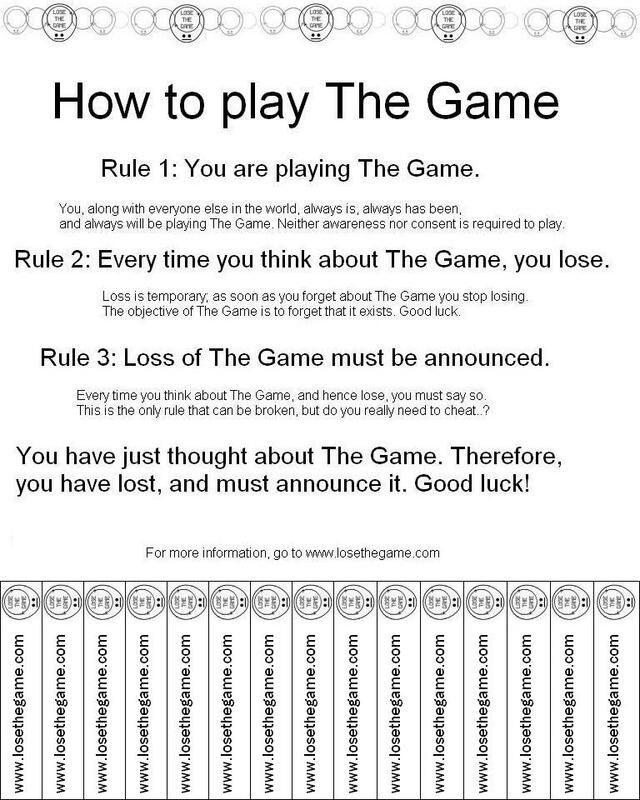 Post links with the words 'The Game' linking to LoseTheGame.com on every forum and website you can to help us get to the number one spot on a Google search for 'The Game'. Everyone searching for The Game (the rapper), The Game (the movie) or even just The Game (football) will be infected! 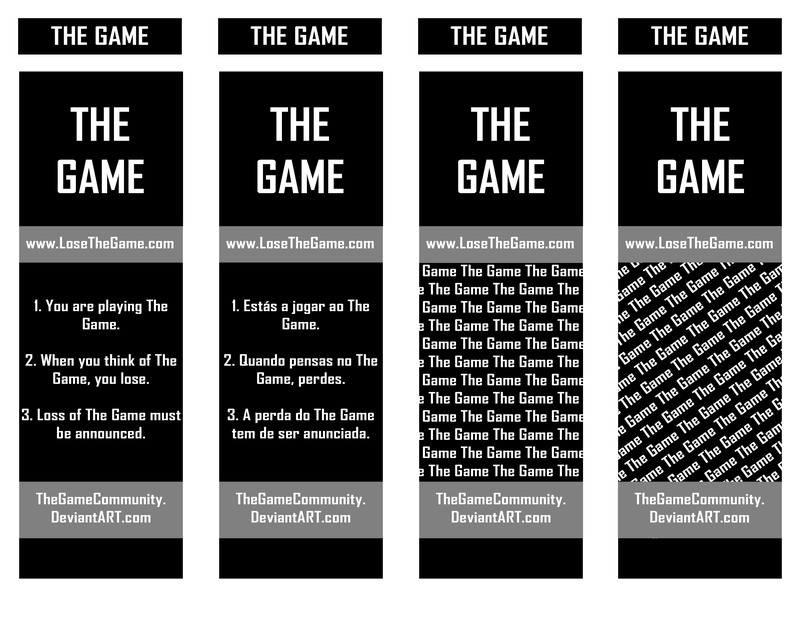 Tweet #losethegame and encourage everyone else to do the same. Let's see if we can get it into the trending tags list that's on every page! Here's a list of all the major online communties dedicated to global infection of The Game. If you know of any more, please contact us! Make your friends lose when they least expect it. A classic strategy, and a trick that never gets old. 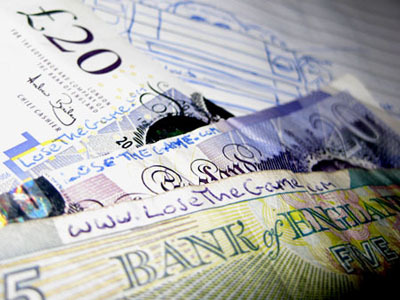 Hide notes that will make people lose everywhere you can; the more creative the better. Inside books, drawers, your friend's pocket... sticky notes on light switches, mirrors... the possibilities are endless. This photo was featured on the front page of the UK Metro! 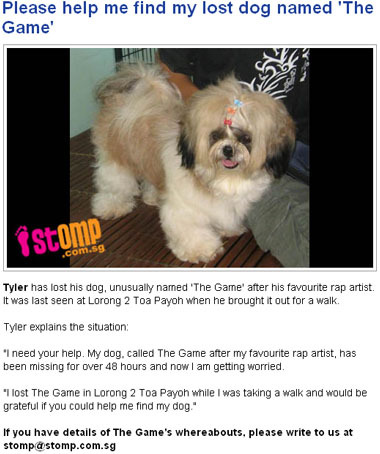 Try to get stories published in newspapers or on news websites with hidden references to The Game. 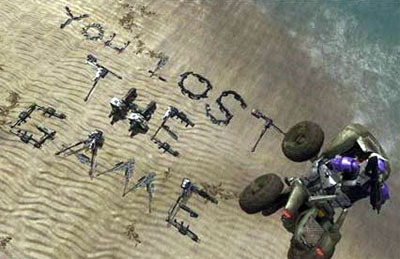 You can also hide messages in multiplayer online games like World of Warcraft, LittleBig Planet or Halo (see below). If you're going to a busy place, like a music concert, sports event or just the center of town, make a big banner or sign, or wear a Lose The Game t-shirt. Pimp your ride Game-style with a home-made car sticker! Want us to email your friends and make them lose? Send us your friends' email addresses and Twitter usernames on our contact page and we'll send sporadic messages that make them lose The Game. We use curious email subjects and mutliple email sources to ensure there is no escape. 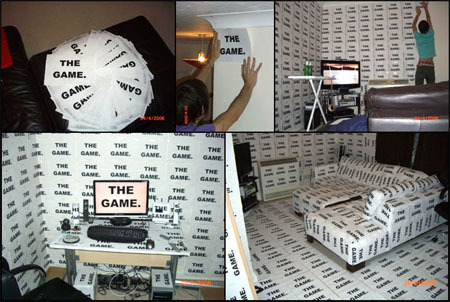 Place sticky notes under computer mice so when people check why it isn't working they see "Brought to you by LoseTheGame.com"
Change desktop backgrounds and screensavers to something that makes everyone lose. Change the Windows start-up sound (and other Windows sound effects) to something that will make people lose. Change all their browsers' home pages to our Ultimate Home Page. Hijack the intercom, assemblies, performances, meetings and emailing lists. Make your whole class do their projects, experiments, essays and other work all about The Game. Infect your teachers or boss! Get The Game banned, censorship always backfires! Use our posters and fliers (in the 'Hidden notes' section above) or design your own and send them to us too! Hide folded paper around with "Do not open" on the front. 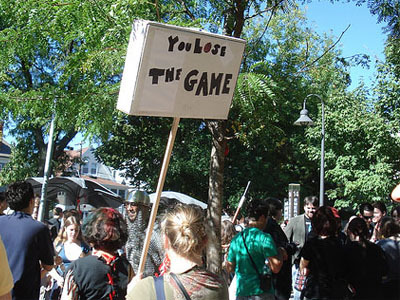 Start a "Lose The Game" group for extracurricular activites. Build an elite task-force to devise even better strategies. Organise psychological experiments based on The Game for science projects. Put up posters to find participants. Please contact us with any more ideas! Check out our YouTube playlist of over 70 songs that will make your friends lose The Game. Send them a link to an 'awesome' song that you just found and wait for the losses to follow. If you've got any suggestions for new songs that might make people lose please let us know. What happens if you copy this sentence, paste it into Google, and hit enter? World Leader Challenge - Which county's leader will lose first? Which country will be first to convince their leader to lose The Game on national TV? A monumental event in the history of The Game and humanity itself, it would make international headlines and infect the whole world with The Game. 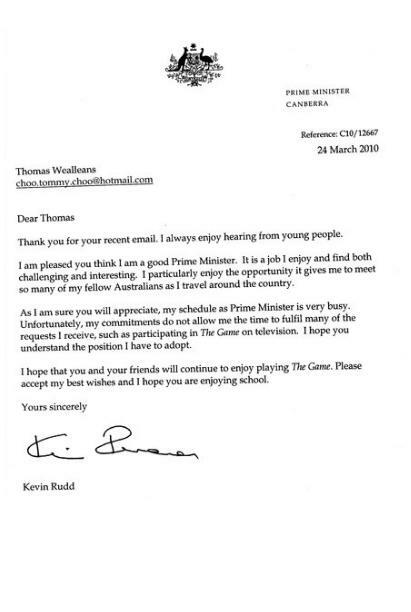 So far we have only had one reply, from Kevin Rudd, former Prime Minister of Australia. All of our attempts to petition the British Government into making The Game a part of British law have failed so far. 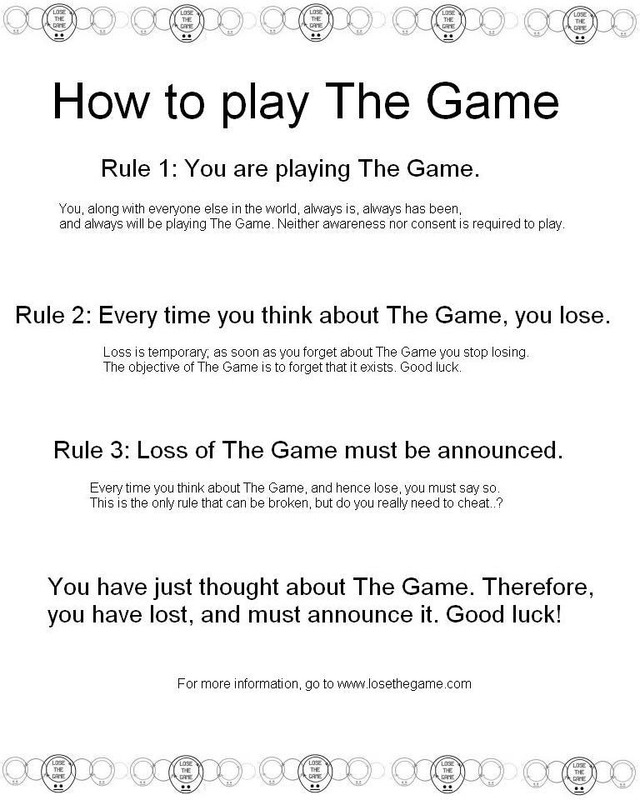 Our first attempt, for 'the Prime Minister to lose The Game and announce it to the nation' was rejected because (supposedly) 'It doesn't actually request any action'. Our second attempt, for the Prime Minister to 'pass legislation that requires all British citizens to abide by the rules of The Game' was rejected because (supposedly) it was 'Intended to be humorous, or has no point about government policy'. Our attempt for Bristol City Council to 'pass legislation requiring anyone within the city of Bristol to abide by the rules of The Game' was rejected as it was (supposedly) 'not relevant to some matter in relation to which the council has powers or duties'. A community of artistic deviants determined to paint The Game across the world in psychedelic colours so bright they can be seen from other dimensions. Click here to check it out! I don't know what you're thinking; now isn't that a shame? 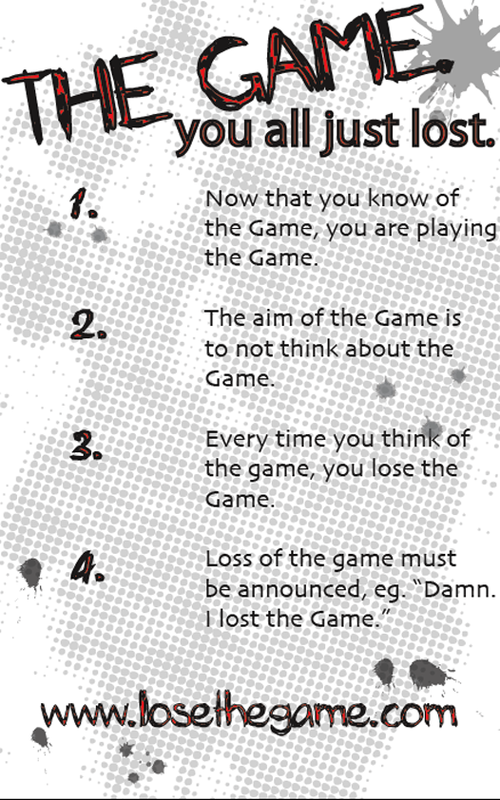 To remember The Game is your downfall. Listen to the moans of the people you've shown. 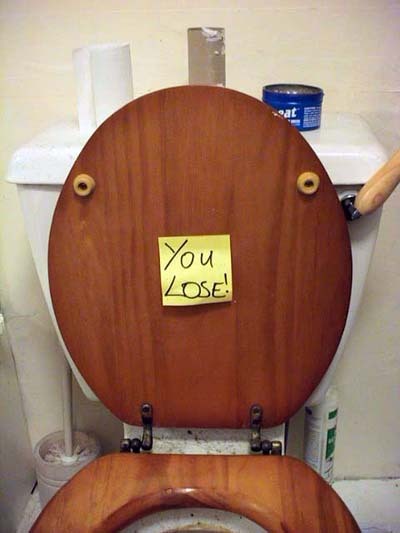 Dammit I Lose and so do you! So the best thing to do is to forget again. The Game will spread like bubonic plague. Because I've passed the curse to you. There is no end, you can't go back. You are always playing, never ending. And the rules are never broken. So that you don’t lose. That you just lost The Game. help you rapidly announce your loss all over the internet. can be secretly (and irreversibly) installed on your friends computers to make them lose sporadically. automatically insert references to The Game on random Wikipedia articles. Stay tuned for the final releases. If you're a programmer and feel like making something to help the world lose, please get in touch. Be warned, after years of puzzling, nobody has come close to a solution; these puzzles are tough! Know any geniuses? Send them these puzzles, and if they ever solve them, they're gonna lose, big time!